Here is a prime example of where Manneco brings to our customers the very finest products available within the industry. Manneco's Heavy Duty Commercial Grade C-9 Light Lines are made on 14 gauge MTW multi-stranded copper wire and use twist-on sockets. Our heavy-duty C-9 light lines are in place on buildings and along city streets throughout the country. They provide our customers with minimal maintenance decorative light lines that can be left in place year round for many years - sometimes up to twenty (20) or more years! You may choose the standard incandescent C-9 lamp (available in clear, red, green, amber or blue) or our new and superb C-9 LED lamp which even further reduces your annual service or maintenance as well as electrical power consumption. 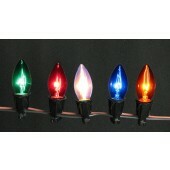 Our new C-9 LED light lines provide fade resistant and vibrant colors not previously possible! 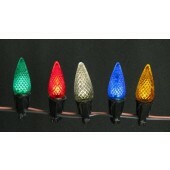 They are available in Warm White, Cool White, Green, Yellow, Red & Blue.